Homemade green juice designed for good digestion made with celery, cucumber, orange, and lemon. This powerfully nutritious celery juice is great for restoring digestive balance, preventing sickness, and replenishing electrolytes. I’ve been reading about the benefits of celery juice on digestive health over the last few months and figured it was high time I make it myself at home. I had been purchasing store-bought green juice that contained celery but wanted to try a higher concentration of it to observe the full health benefits. As it turns out, when celery juice is consumed alone, it has some powerful healing properties. 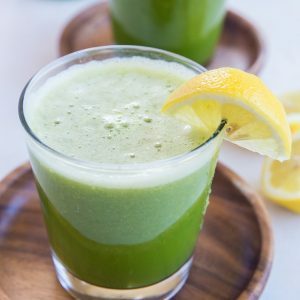 I provide a recipe at the end of the post which includes other ingredients, but do keep in mind to unlock celery juice’s full benefits, you will want to consume straight celery juice. Before we dive into my good digestion celery juice recipe, let’s discuss the science-y stuff. Increases natural production of stomach acid to help you digest food. Celery juice is a natural antibiotic and antiparasitic. For those of you who struggle with candida, SIBO, and/or leaky gut, regularly drinking celery juice each morning on an empty stomach can help kill off unwanted visitors. Great source of Vitamins A, C, and K.
Contains electrolytes, magnesium and potassium, making it a very hydrating beverage. Contains beta carotene, iron, and calcium. Studies show celery juice may help lower blood pressure. A natural antioxidant, celery juice helps prevent oxidative stress and may help reduce the harmful effects of chemotherapy. The flavanoids in celery juice help act as a natural anti-inflammatory. 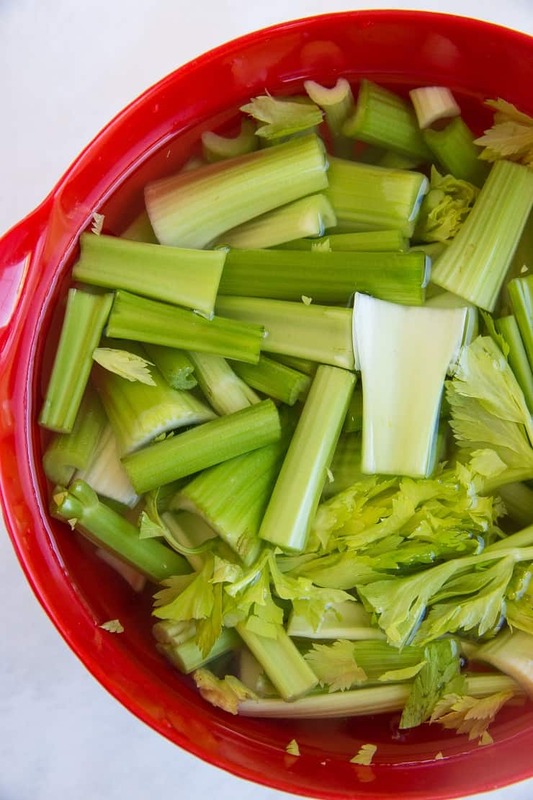 Celery juice may help lower cholesterol. May help balance blood sugar (assuming you aren’t consuming lots of carbs and sugar in your diet). Helps relieve constipation and therefore protects against digestive disorders when consumed regularly. Makes your skin nice and glowy. Putting it all together, celery juice is a nutrient-rich, very hydrating and potentially healing beverage, that helps your body achieve a good acid-base balance, replenishes vitamins and electrolytes that nourish your body and keep your digestive system running smoothly. How’s that for a celery juice testimonial? 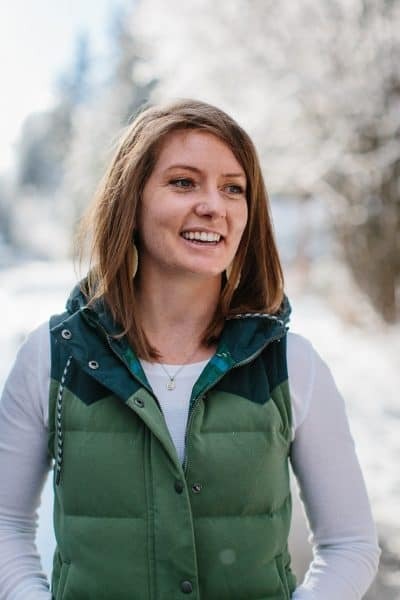 We often overlook the importance of electrolytes, but our body needs them for so many different functions, including the natural ability to detox our liver, proper digestion, hormonal balance, quality sleep, and more. The fact that celery juice has a natural anti-microbial benefit makes it attractive to those with chronic gut conditions. Does this mean celery juice will cure all your woes? Nay. It means it is one tool you can put in your wellness arsenal to help you along the way. Before setting out on my juicing adventure, I did a bit of research on the best type of juicer to use. 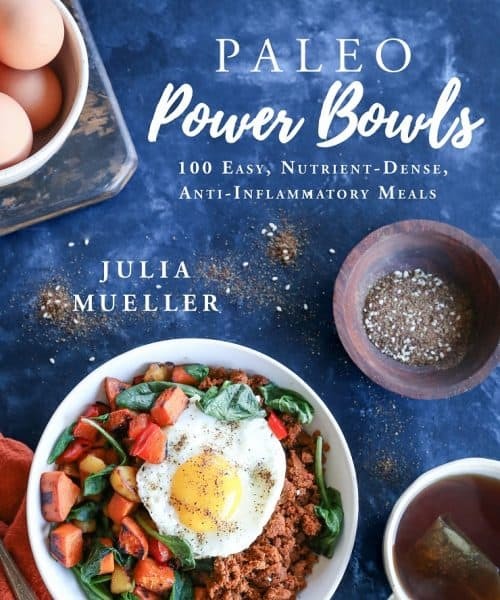 From what I gathered, you want to use a quality masticating juicer that can handle hearty vegetables like celery, carrots and beets, and can also handle fibrous leafy greens. 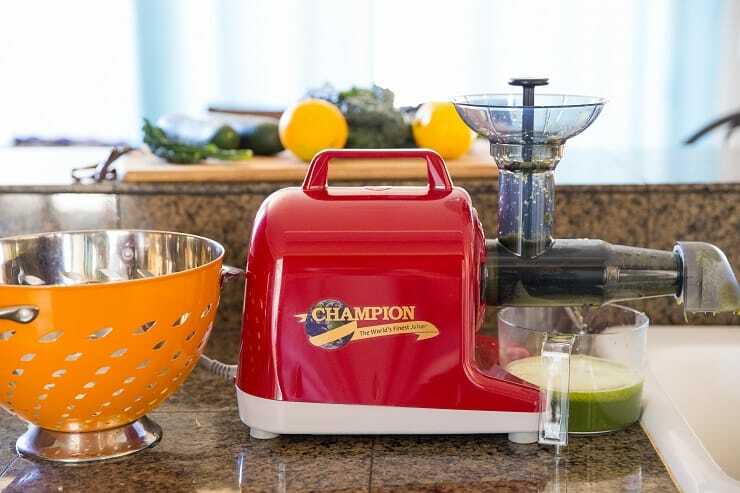 Champion graciously sent me their Elite 4000 series juicer, which includes two types of augers so that you can juice fruit, vegetables, greens, and also make nut butter, frozen smoothie (kinda like nice cream), soups, sauces, and more. 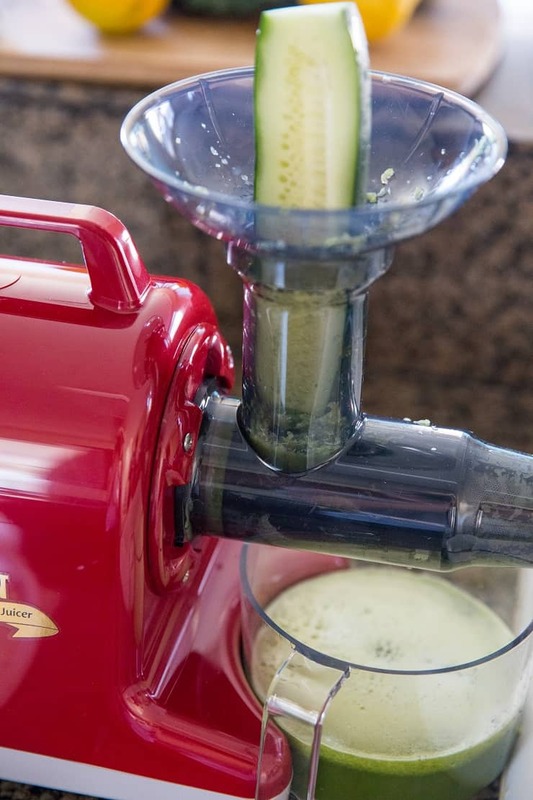 The juicer is super efficient and versatile! I’m amazed at how well the juicer operated given the amount of produce I put through it in one juicing session. I definitely recommend it, whether you’re a juicing newbie or a seasoned juicer extraordinare. SO now that we know the ins and outs of celery juice, let’s talk about this particular juice recipe. Remember, celery juice’s health properties are best observed when consumed alone so you can 200% JUST juice celery; however, I wanted to provide a simple recipe for a juice I’ve been making that tastes great, has natural anti-parasitic qualities, and is also beneficial for your health. In addition to celery, I like using cucumber, an orange, and half a lemon. All things considered, this elixir wins you a gut-healthy beverage that aids your liver and also tastes very pleasant! And this is coming from someone who does not love the taste of green juice. Be sure you use all organic produce every time you juice. If you use produce that is not organic, you’ll be drinking a heavy concentration of pesticides, which messes with your gut health, hormones, and overall immune system, as they are toxic to your body. Soak your organic produce in an apple cider vinegar bath for at least 15 minutes before juicing it. This will kill any parasites or bad bugs that may be dwelling on the produce. For those of you with digestive issues, keep your juices as low in sugar as possible. Sugar, even coming from fruit and vegetables, feeds bacteria of all types, and this includes your bad bacteria. Don’t go crazy with apples, as they produce some mega tasty food for any parasites or bad bacteria living in your digestive system. Make a big batch! Juicing is time-consuming, so make an evening of it! Buy more produce than you need so that you can make a huge batch and freeze what you won’t be drinking within a 5-day window. 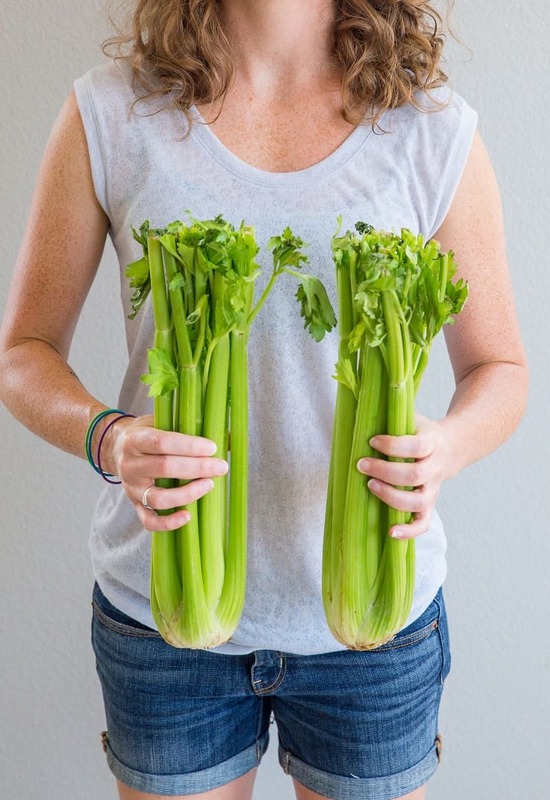 If you have IBS, start by drinking only a small amount of celery juice (4 to 6 ounces), as large quantities could cause a flair – celery is high in fermentable carbohydrate and although the fiber is removed, it can still cause tummy troubles for those who are sensitive to FODMAPs. You can get creative with you juice add-ins. I have also added a few carrots and a 2-inch nub of ginger to the recipe below for added flavor and health benefits. If you’re looking to detox, you can add fresh parsley and turmeric for a powerful detoxification elixir. If you try this Good Digestion Celery Juice, please feel free to share a photo and tag @TheRoastedRoot on Instagram! Soak all ingredients in a bath of apple cider vinegar and water for 15 minutes prior to juicing. (I use about 1/2 cup of cider vinegar per 1 gallon of water when I soak my vegetables). Follow the instructions according to your specific juicer (I use a Champion juicer). Once all ingredients are juiced, strain the juice through a fine-mesh strainer to remove the pulp. Drink immediately or store in an air-tight jar in the refrigerator for up to 5 days. 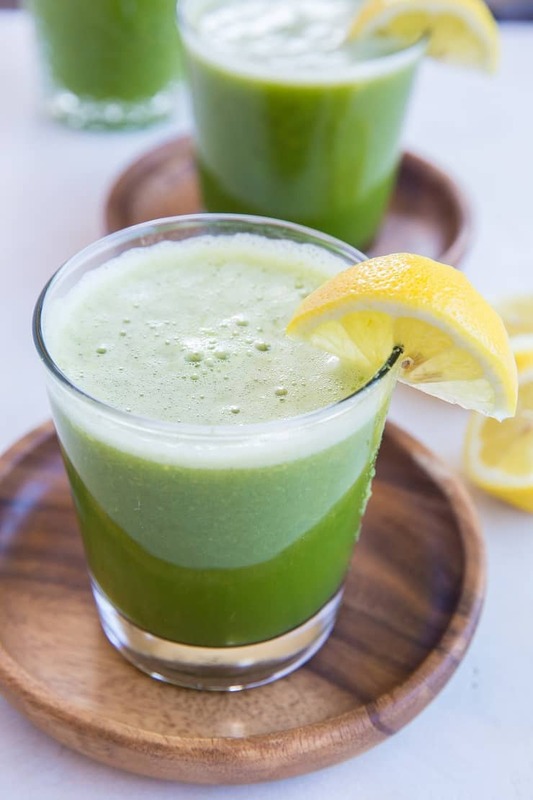 Celery juice is an effective natural diuretic, and along with its ability to flush toxins out of the body, it reduces bloated abdomens and edema, too. If you use celery that’s not organic ok? It’s a must to soak all th veggies you use or just the celery? Will a magic bullet work to make celery jc. I don’t have a juicer. I’m excited to try this, as opposed to meds. Thanks. I would also like to know this as organic is 3x the cost.